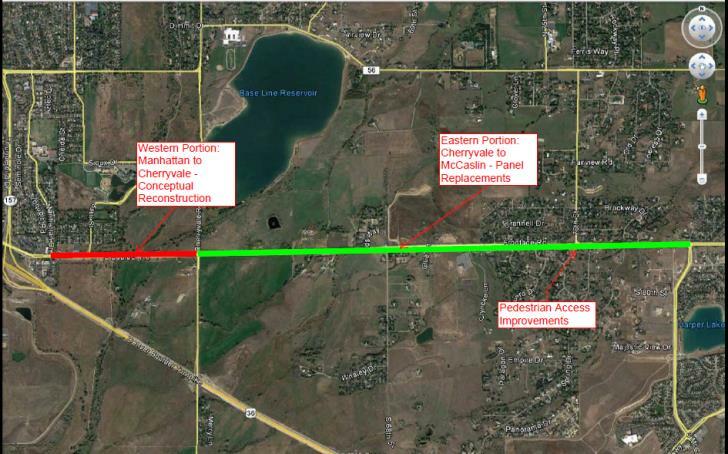 Reconstruct the entire road between Manhattan Drive (City of Boulder) through the intersection with Cherryvale Road. The new surface will be concrete, asphalt, or a combination of the two. Improve the pedestrian crossing, stormwater drainage system, and transit stop access at the 76th Street intersection. Project plans will be posted here as soon as they’re available. Funding has not yet been identified. Options will be identified as the study and public process is completed.